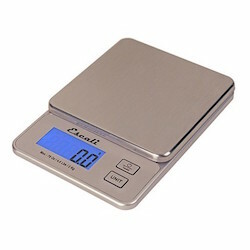 This hand-held, ultra-sensitive mini scale is a 4-1/2" x 3-3/4" x 1" scale that measures up to 17-1/2 ounces (500 grams). This is an extra-sensitive capacity normally only found in larger, more expensive scientific scales. A great multi-functional scale for use at home, restaurant, laboratory, office, food portioning control, postage or hobby use. Measures in high precision increments of 0.1g./0.01 oz.